President Obama on Monday awarded the Medal of Honor, the nation's highest military decoration, to Army Staff Sergeant Ty M. Carter for the heroism he displayed during one of the most intense battles of the Afghanistan war. Mr. Obama called Carter a "true American hero." In the Oct. 3, 2009 battle at Combat Outpost Keating, Carter rescued a fellow soldier and carried him through a hail of bullets, unarmed. On that day nearly 300 insurgents, armed with automatic rifles and rocket-propelled grenades, surrounded the outpost in Afghanistan's Nuristan Province. Fifty-three Americans were stationed there; eight were killed in the battle, and 22 were wounded. In an interview with CBS News National Security Correspondent David Martin, Carter described how he knew from the start that the outpost was a dangerous place to be. "We kinda knew what was going to happen. We just didn't know when," he said. "We knew that the enemy would take advantage of the terrain and hit us hard." He explained that the terrain, surrounded by high mountains from which the enemy could shoot down on the outpost, was clearly undefendable. "In my head I thought 'you gotta be kidding me,'" he said. "You think of the military or the Army as being this huge force with the money to support and the intelligence and all the assets to give us the edge -- this outpost, we didn't have the edge." When the battle started, Carter ran from his bunk to a guard post, exposing himself to gunfire. "I knew that if I didn't get to that position, to support that position -- if a guard position does fall, then the perimeter falls and then the enemy enters," he told Martin. Carter was wounded in the battle but managed to provide accurate fire against enemy combatants under intense pressure. At one point, he carried his fellow soldier Spc. Stephan L. Mace to safety, putting down his own weapon and facing open fire to save Mace and provide life-extending first aid. Mr. Obama remarked Monday that the enduring image of the battle was of Carter picking up Mace and "carrying him through all those bullets." Mace later died from the wounds he incurred, which Carter told Martin left him "shattered." "The fact that either I didn't get to him in time or I didn't do the right thing made me believe that I had failed fully and completely," he said. After that moment, Carter started receiving treatment for post traumatic stress disorder (PTSD). Medal of Honor recipient: Fellow soldier's death "still with me"
"I don't like the 'D' on the end," Carter told Martin. "I don't believe in calling it a disorder. I believe that it's your body and mind's natural reaction to something traumatic... And if PT, post-traumatic stress is intense enough, it will affect your life. It will remove your ability to be happy and enjoy the company of your loved ones." Carter said he still has "minor issues" with post-traumatic stress but that he's in excellent shape now, thanks to the support he has from his behavioral health care providers, his platoon sergeant and his friends and family. "Everyone who cares for you and worries about you in your life is your safety net," he said. "At any point in time if I'm feeling stressed or if something is going wrong I have people I can talk to." Mr. Obama commended Carter for speaking out about his struggle with post-traumatic stress and urged other soldiers to follow his lead. "Let me say as clearly as I can.. .he is as tough as they come, and if he can find the courage to seek help, so can you," he said. The president added that the nation must keep up its commitment to support those soldiers. "Nobody should ever suffer alone," he said. "And nobody should die waiting for the mental health care they need." Carter is now based at Joint Base Lewis-McChord near Tacoma, Wash., where he lives with his wife Shannon and three children. Earlier in life, he spent four years in the Marine Corps and attended college after his discharge. However, he found the transition back to civilian life difficult, so he enlisted in the U.S. Army in 2008. Carter already has several military decorations, including the Purple Heart, the Army Commendation Medal with four oak leaf clusters, the Army Achievement Medal with two oak leaf clusters and the Army Good Conduct Medal. 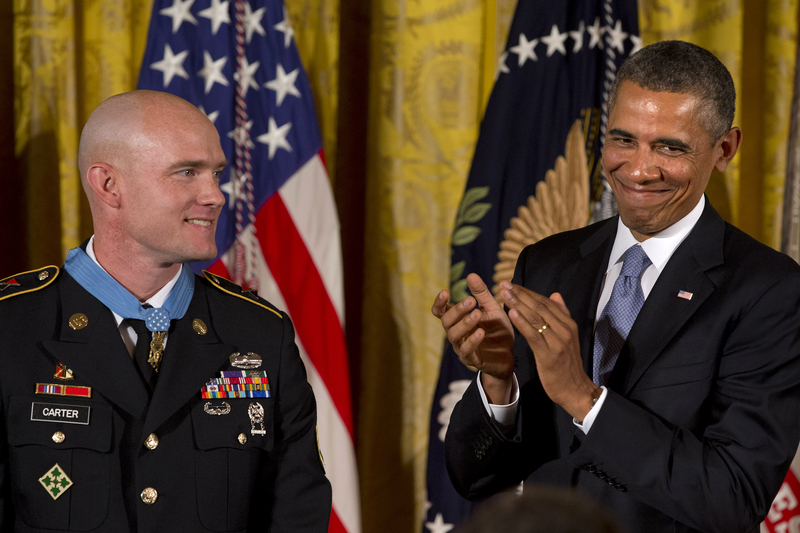 Earlier this year, President Obama awarded Clinton Romesha, a former active duty Army staff sergeant, a Medal of Honor for his bravery in the same battle.